The next session of the Shrewsbury Boardgames Club will be held on FridayÂ 31st October at Garryâ€™s house. I wonder if we’ll be able to find anything new to play. Just a photo for now. More details later. Time to put a few more games up for sale on Ebay. 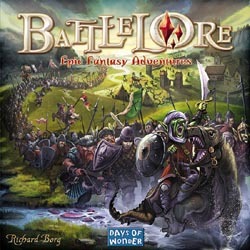 This time, you can bid on Die Baumeister von Arkadia by Rudiger Dorn, Wongar by Alan Moon & Aaron Weissblum, Trapper by Wolfgang Kramer & Michael Kiesling, Lost The Game (in a tin), Khet the Laser Game and last but not least Battlelore by Richard Borg. The list of games for saleÂ is on my Ebay page. Just a quick note to confirm that the next session of the Shrewsbury Boardgames Club will be held on Friday 17th October at Garry’s house. Scott Nicholson (and twin) have recorded a special edition of Boardgames with Scott, featuring the forthcoming game from the Lamont Brothers, Snow Tails. Fraser didn’t appear to be in the best of health when the interview was shot so I hope he’sÂ fully recoveredÂ in time for Essen. At this year’s fair, Reiver Games will be demoing their new game, Carpe Astra, designed by Ted Cheatham and Jackson Pope. The game is a tile laying and networking game for 2 – 4 players aged 12+, with games lasting 30 to 90 minutes depending on the number of players. 10,000 years in the future, humanity has claimed the stars. But all is not well. The Emperor is weak, without strong guidance the Empire is crumbling. Powerful guilds within the empire are squabbling, positioning themselves for their own gain. If the Empire is to survive, it needs a strong leader – that means you! You must build a powerbase throughout the Empire by connecting with important guilds: the military, traders, priests, engineers, settlers and politicians and then claim the throne. Time is running out though, others also struggle for the throne. You must form a network of support with powerful guilds and slandering your opponents. Each connection gains the support of some guilds, at the end of the game the player with the most support grasps the Galactic Throne. Take advantage of events that occur for further gain. Be careful though, as each slander you receive reduces your support. Unfortunately the game won’t be available for sale until the end of November but Reiver Games are taking pre-orders with a 30% discount off the retail price. More info about the game, including the rulebook,Â can be found at the Reiver Games site. The Lamont brothers have a second Essen release this year. This is a collaboration with Friedemann Friese that is being released as Die 3 Gebote by Bewitched Spiele and The Three Commandments by Rio Grande. Each player takes the role ofÂ a High Priestess once and determines the rules of her own religion. The other players are novices trying to sense these rules and thus gather as much karma as possible. The “priestess” player secretly chooses four cards that determine which actions are rewarded and which taboo. The other players simply move a pawn on the board and are awarded points by the priestess based on how their actions (including seemingly irrelevant ones like body movement or tone of voice) correspond with the rules. At the end of a round the priestess receives the same score as the highest-scoring adept, encouraging her to make the rules difficult but not impossible to guess. This looks an interesting deduction game that could be a load of fun, depending on which obscure rules are picked by the players. Last night, Jan, Rebecca and I sat down to try High Score, a Ravensburger game designed by Heinz Wuppen, which you can actually play with two standard six sided dice and a score sheet. Despite the minimal components, the game is great: Take It Easy with dice rolls rather than tiles. I had a really good first round and an awful third round but just managed to stay ahead of Bex who scored pretty consistently in each round. Garry: 63+59+26=148; Bex: 48+54+41=143; Jan: 37+43+25=105. This was great fun with just the same agonising decisions as in Take It Easy. A definite rating of 8 from me. 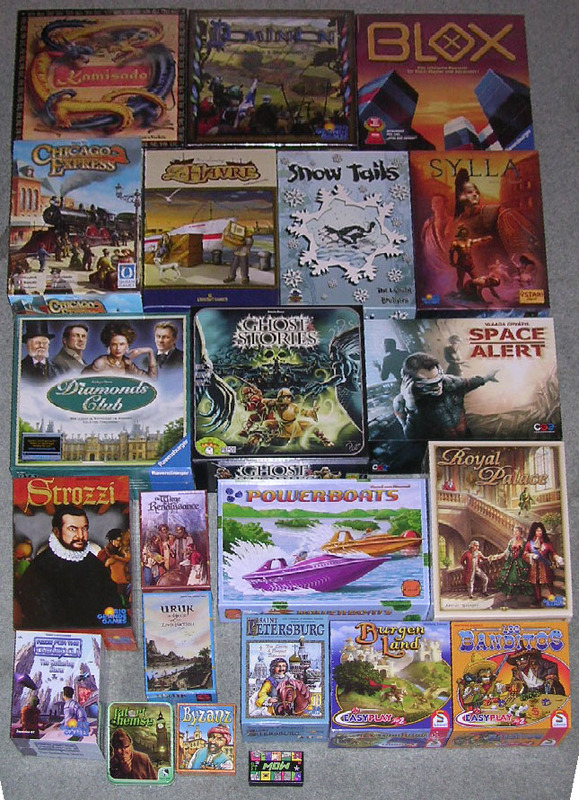 The next session of the Shrewsbury Boardgames Club will be on FridayÂ 10th October 2008 and will be at Garryâ€™s house. 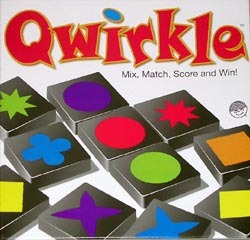 Jan and I played Qwirkle for the first time last night and I’m not sure whether I like it or not. Sort of like Scrabble but with colours and shapes instead of words, you basically add tiles to a grid by matching colour and or shape, scoring points according to how many pieces you connect to in a line. This is not a game Nige is likely to enjoy as the spatial awareness and pattern / colour-recognition element is high. However, it seems to be a case of optimising your score on each turn with the tiles you have, while not setting up your opponent for a potential big-score. There doesn’t appear to be much opportunity to set yourself up for future turns (especially if playing more than two-player) and it seems to be a case of hoping to draw good combinations of tiles at theÂ right time. That said, it is easy to play and our game came down to the very last tile to determine a winner. Also, Jan likes Scrabble so this is one she’d be more likely to play again. Hopefully, we’ll try it again soon.